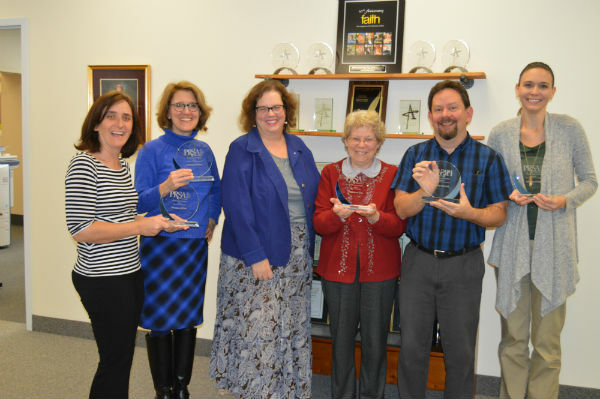 Staff of the Diocese of Erie's Communications Office garnered four gold Niagara Awards at the celebration held by the Public Relations Society of America’s Northwestern Pa. Chapter Nov. 15. In addition, they took Best of Show for having earned the highest score among gold Niagara winners. Awards were received in the Internal Communications category, for work on the “Pastoral Response to the Opioid Crisis,” an effort overseen by the diocesan Opioid Task Force under the leadership of Ann Badach, executive director of Catholic Charities; and in the Community Relations category for collaboration with Bishop Lawrence Persico and Vicar General Msgr. Edward Lohse regarding the release of information concerning the diocesan update to its Policy for the Protection of Children. In addition, Faith magazine received two Niagaras in the Publications category, one for its overall efforts, and another for the special edition dedicated to the Pennsylvania 40th Statewide Grand Jury Report. The Diocese of Erie was among 16 entities in the region who received recognition from among nearly 60 entries. Niagara Award judges from ten regions including Pittsburgh, Charleston, New York City and Cleveland selected the winners.